Thum! Kaun Aata Hai? : Brahmos Test on July 8, 2014: What Made it Different? Brahmos Test on July 8, 2014: What Made it Different? 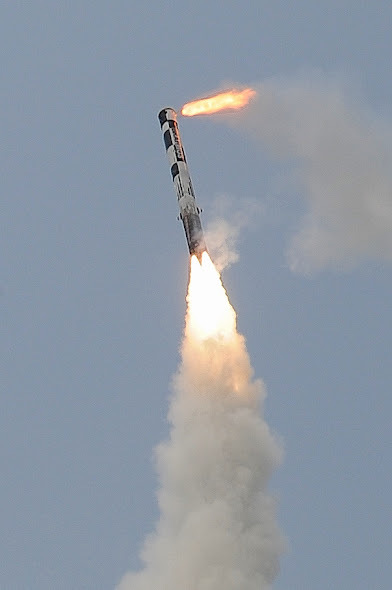 Brahmos developmental test on July 8, 2014. DRDO classified the Brahmos missile test on July 8, 2014 as a developmental flight and its press release stressed that the test demonstrated the missile's ability to strike a hidden target without seeker based terminal guidance. The press release also claimed that the navigational system used on the missile was a world first. According to the TNIE, the missile featured a G3oM navigational system on chip (SOC) weighing just 17-gm, which was developed by DRDO's Research Center Imarat (RCI) lab and produced by Bengaluru based private company Accord Software. Based on an agreement with Russia and India's funding of the GLONASS system, India has access to GLONASS military signal, which is more accurate than the civil signal. India has also developed its own GPS augmentation system, GAGAN, which has an accuracy close to the GPS military signal. In other words, India has assured access to two highly accurate satellite based navigation systems. Based on an analysis of past press reports, it appears that the G3oM chip can utilize either GLONASS military signal, or GAGAN, seamlessly and automatically switching between the two, to provide positional updates to host missile or aircraft to an accuracy of 3m. G3oM reportedly features two antennas for redundancy; in case one antenna gets shielded as a result of maneuvering by the host missile, aircraft or even tank, the other antenna ensures access to the satellite signal. In future, Indian missiles will also have access to the military signal of IRNSS. The G3oM is small enough to be fitted on Pinaka artillery rockets and smart bombs to make them deadly accurate. IDP Sentinel members can read more about the Brahmos and its variants at the link below.